Dementia Australia applauds the announcement by the Prime Minister, Scott Morrison and Ministers for Health and Aged Care that dementia and younger people in aged care have an elevated focus in the Terms of Reference released yesterday for the Royal Commission into Aged Care Quality and Safety. Dementia Australia CEO, Maree McCabe said with 70 per cent of people living with dementia residing in the community and around 50 per cent of those in residential aged care with a diagnosis of dementia, these Terms of Reference highlight that dementia must be acknowledged as core business for aged care. “In particular we are pleased there has been a significant inclusion of Dementia Australia’s Terms of Reference suggestions that were submitted to the Department of Health in September 2018,” Ms McCabe said. · engagement with all people impacted by dementia, including families and carers. “Whilst it is evident there are systemic deficiencies and challenges in aged care around staffing, education and the capacity to provide quality of care, it is encouraging that quality and safety, are paramount in these Terms of Reference,” Ms McCabe said. “We commend that the Terms of Reference will seek out examples of good practice and innovative models in delivering aged care services. “Dementia is one of the largest health and social challenges facing Australia and is the leading cause of death of women in this country. Dementia Australia reinforces the earlier call for a solutions-based approach to the Royal Commission to identify a clear path forward to improve the health and care outcomes of the more than 436,000 people living with dementia in Australia. Dementia Australia is the national peak body and charity for people, of all ages, living with all forms of dementia, their families and carers. It provides advocacy, support services, education and information. An estimated 436,000 people have dementia in Australia. This number is projected to reach more than 1.1 million by 2056. Dementia Australia is the new voice of Alzheimer’s Australia. 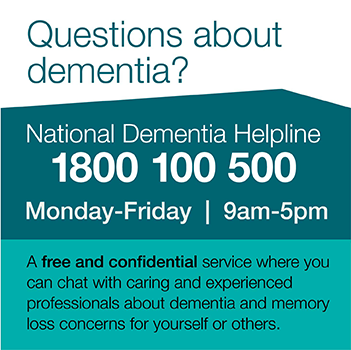 Dementia Australia’s services are supported by the Australian Government.